It has been a long time – too long a time, really – since I posted a book review. But I completed a little book this evening, which had been recommended to me by a friend, so I will give it a little plug. 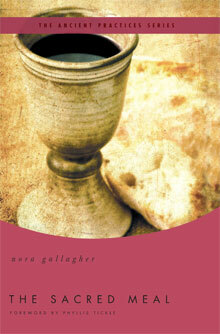 As the title suggests, The Sacred Meal is about the Lord’s Supper, Eucharist, Holy Communion. (It is part of “The Ancient Practices Series” of books edited by Phyllis Tickle, and published by Thomas Nelson.) The author is a writer and novelist who is also a lay altar server in her local Episcopal Church in California; she writes from those perspectives, and her writing suggests that she might find herself a bit left-of-centre in the Episcopal theological spectrum. If we look at the Lord’s Supper as having two primary players – Jesus and us – Gallagher writes as an incarnationalist and a communalist, if I may employ those two terms as a matter of my own interpretation of the book. She strings together a variety of stories, mostly from her own experience, which highlight the importance of the Eucharist as a gathering of people from all walks of life and all manner of baggage attached. She also writes with a very human understanding of Jesus. While I would assess that her good intentions also reveal a somewhat flawed hermeneutic – from my rather more conservative, Reformed perspective – Gallagher also gives us some very helpful thoughts to consider in our celebration of Communion, irrespective of the tradition in which we celebrate it. For example, as part of her recounting of one serving experience, she says, “Holy Communion was a web, a web of people who were being stitched together. And tomorrow, we would need to be stitched together again. Over and over. One person to the next” (p. 6). And the Lord is part of that stitching. She writes, “Jesus wanted his disciples and everyone who came after him to remember what they had together. What they made together. What it meant to be together. How the things he wanted them to do could not be done alone. How the things he did could not have been done without them” (p. 24, emphasis hers). Too often, many in the church see a communion-less Communion: It’s “Jesus ‘n’ me,” instead of “Jesus and us.” We are all in this together at the Lord’s Table. Our individualistic approach causes us to lose perspective on the communal nature of our celebration. Gallagher emphasizes the importance of frequent celebration when she writes, “The regular practice of Communion is meant to help us move from being the citizens of an empire to the citizens of heaven” (p. 34). Many of her stories are heartwarming; some are heart-wrenching; all make the reader think about what the sacred meal can be for participants. While I don’t agree with everything in this book, I think it is well worth the 137-page read. Nora Gallagher, The Sacred Meal. Nashville: Thomas Nelson, 2009. ISBN 978-0-8499-0092-1.